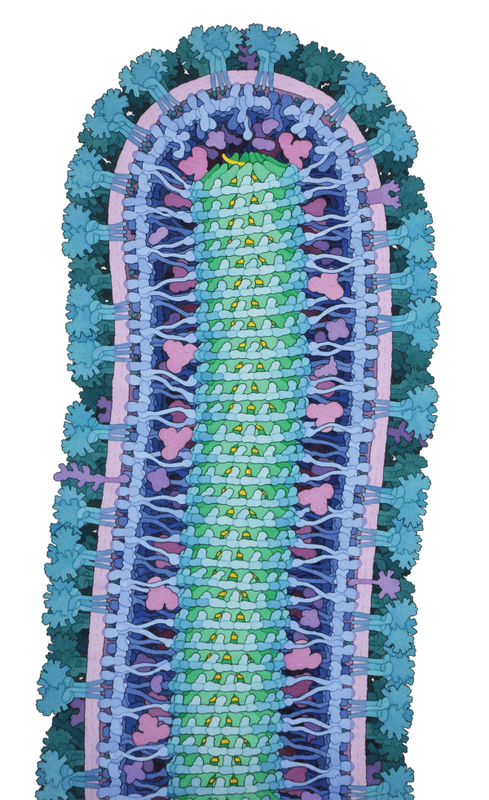 Ebola Virus, by David S. Goodsell. The virus is surrounded by a membrane (pink/purple) stolen from an infected cell. This is studded with proteins from the virus (turquoise) which extend outwards and look like trees rooted in the membrane. These proteins attach to the cells that the virus infects. A layer of proteins (blue) supports the membrane on the inside. Genetic information (RNA; yellow) is stored in a cylinder (nucleocapsid; green) in the centre of the virus. David talks about his creation process in this video created for the Wellcome Trust.